The first week was a roller coaster! After catching up on sleep, I began to put down roots. Our CEO, Josh Walker, upon learning that I and Alex Resnick spoke some Turkish, invited us to a high-key Turkish press conference to kick-off the opening of the Turkish pavilion. Using our Turkish, we were blessed to make some friends with people from Turkmenistan, Azerbaijan, and the with the Hotel Manager. Most memorable, however, was our “soft opening” day where I was able to party Latin-style with fellow pavilion workers from Latin America. The evening was filled with dancing. 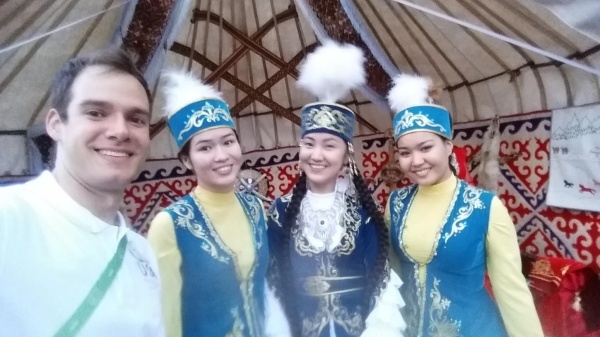 This continued to our Expo Village where Expo pavilion volunteers and workers ate and mingled with Kazakhs in traditional clothing. After learning a traditional dance, I got to teach our Kazakh hosts a line dance and enjoy being included by them, together with the other student ambassadors, as if we were family.